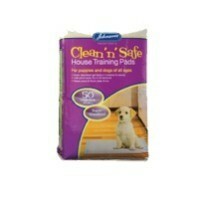 Johnson’s Home Training Pads are super absorbent and leak proof, locking in moisture and bad odours. These brilliant pads make toilet training your puppy easy and hassle free. The super absorbent gel works to keep you floors and carpets clean and dry and your home smelling fresh, and because these dry super-fast, your pup won’t be leaving any soggy paw prints around your home! Each pads measure 45cm x 60cm.